A Crossover Network or Circuit consists of separate subcircuits; each one being an electrical filter connected to a loudspeaker. All filters of a Crossover Network are connected to the Speaker System's input terminals. All filters receive the same electrical signal coming from the amplifier. The LowPass Filter allows for low frequencies to be sent to the Woofer Driver; frequencies higher than a specific limit are attenuated. The BandPass Filter allows for mid frequencies to be sent to the Midrange (or Squawker) Driver; frequencies outside a specific range are attenuated. In a similar sense the HighPass Filter allows for high frequencies to be sent to the Tweeter Driver; frequencies lower than a specific limit are attenuated too. -How does a Crossover Filter control the electrical signal fed to a Loudspeaker Driver? Well, filters are placed just before Loudspeaker Drivers as shown in the following diagram. Desibells are very useful for ratios. 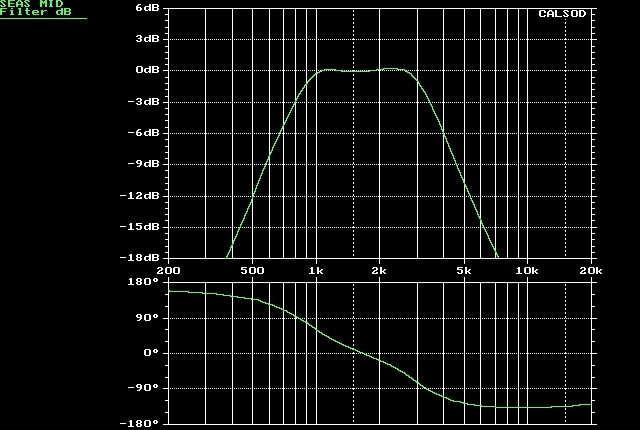 When filter's output equals input (no attenuation) the gain becomes 0 dB. Positive decibells correspond to voltage amplification of input signal. PassBand is a range of frequencies that go through a filter with a relatively low (or none at all) attenuation. At PassBand the filter's Gain Response is either 0dB or a flat negative value. Stopband is a range of frequencies that go through a filter with a relatively high attenuation. Gain has a more negative value than what it has at filter's PassBand. We need a way to decide at which frequencies do these ranges ( the PassBand and StopBand) lie. For this reason we define Cutoff Frequencies. When filter's Gain at PassBand is 0dB, Cutoff Frequencies are those for which Gain equals -3dB. Frequencies beyond the Cutoff Frq. with more negative Gain outline the filter's StopBand. When filter's Gain at PassBand is a different dB value, Cutoff Frequencies are those for which Gain is 3dB lower than PassBand's value. Frequencies beyond the Cutoff Frq. with more negative Gain outline the filter's StopBand too. Figure on the right illustrates the Gain Response of an electrical filter for frequencies in the range 1 to 7 kHz. A lot of information is provided by this graph. At 1000 Hz and 5000 Hz output voltage is approx. 3.16 times larger than of input (+10dB). At 7kHz Gain drops to 2dB. Obviously that filter provides signal amplification. For this a power supply is needed. Such filters are called active. Crossover filters can not provide amplification; they are passive. Their Gain Response can not exceed 0dB at any frequency. Filters also have a Phase Response. Figure on the right depicts the Phase Response of the previously discussed filter. It is interesting that in the range of 1.5 to 3.5 kHz output signal is shifted by 180 degrees with respect to input; it is actually inversed. 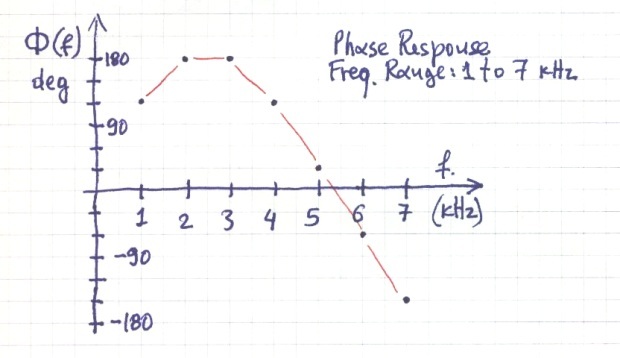 Phase Response of Crossover Filters actually add to Phase Responses of attached loudspeakers. Therefore they play a key role in the way emitted soundwaves 'add' at listening point. -What do we mean when we say that a filter's Gain interacts with the attached driver's SPL Response? When filter's Gain ( at a given frequency) is a negative dB value, filter's output is attenuated (at that frequency). Thus the electric signal fed to the attached Loudspeaker Driver is relatively lower (than the signal of other frequencies) so the corresponding wave amplitude emitted by the driver's diaphragm is also attenuated at that frequency. Crossover Filters and Loudspeakers are combined into what what we call Acoustic Branch of the overall Speaker System.Each Acoustic Branch has an SPL Response (in dBs) which equals the sum of the Filter's Gain and the Loudspeaker's SPL Response. At frequencies where filter's Gain is 0dB the overall (Acoustic Branch- emitted wave) SPL Response simply equals the value of the Loudspeaker's SPL Response. Instead, at frequencies where filter's Gain is negative, the overall SPL Response equals the Loudspeaker's SPL Response reduced by that negative value; attenuation has been accomplished. -Could we have a worked out example? Figure on the right depicts a HighPass Filter with a Gain Response having a cutoff frequency of 3900Hz. PassBand is obviously above 3900Hz and StopBand at frequencies below this value. 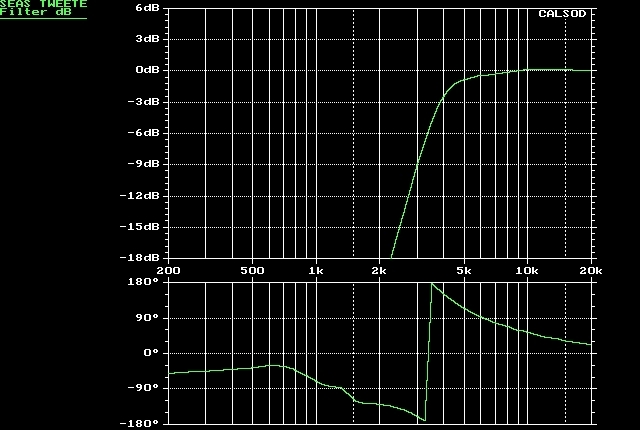 Filter's Phase Response can not be neglected. Its influence will be discussed later on. Yellow (dashed) curve corresponds to a Tweeter Driver connected to the HighPass Filter described above. The emitted high frequency wave ehxibits a PassBand (of an averaged 91-92 dB approx.) and a cutoff at 4kHz (88-89 dB). StopBand lies below 4kHz. In general there is always a (small) difference between Crossover Filter and overall Acoustic Branch values of PassBand,StopBand and Cutoff Frequencies. All of them will be addressed in another article dealing with design procedures. Let us study another example, that of a BandPass Crossover Filter. Figure on the right illustrates the Gain Response of a BandPass Filter having a flat 0dB gain at PassBand and Cutoff Frequencies @ 800Hz and 3500Hz. Apparently such a filter is meant to drive a Midrange or Squawker in a 3-Way Speaker System. Its Gain falls down with at a rather steep rate outside the Passband. Often this roll-off rate is used for design purposes. When the Gain Response of the BandPass Filter above is combined to the SPL Response of the associated Midrange Driver (yellow dashed curve), we end up with the overall SPL Response of the (midrange) Acoustic Branch given by the solid green curve. A Roll-off rate is a very useful data. It is expressed in dB of response change per frequency octave. An octave is range where frequency doubles. Let us try to evaluate the Roll-off rate of the previously discussed HighPass Filter. Let us study the range 2kHz-4kHz (an octave) where roll-off occurs: SPL value of -3dB falls down to -21dB approx. giving a change of 18dB. Thus this filter's roll-off rate is approx 18dB/oct. Now let us try to do the same thing to the BandPass Filter discussed above: At the left-hand sideband (400-800Hz) we get a 14dB/oct value. At the right-hand side (3.5-7kHz) we get a similar value of 14.5dB/oct. Such filters are called symmetrical. -What about Crossover Filters' Phase Responses? Now it is time to try to investigate how the above discussed examples of the midrange and high-frequency Acoustic Branches would work together at the listener' position. In other words let us see how these two emitted waves sum up together in space (at listening position). Our simulation software puts in the same graph the SPL Responses formed by the two filters and the attached Loudspeakers. Their wave addition is confined in a narrow frequency range where these two Acoustic Branches emit sound of significant intensity. Significant intensity is typically maintained down to -20dB under the PassBand SPL value. 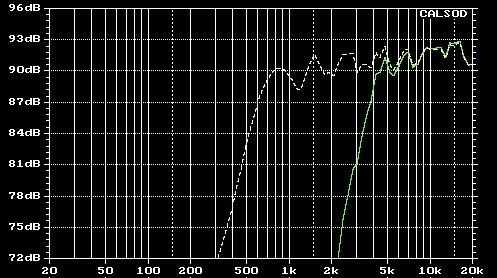 In that sense these two filters and drivers cooperate in the range of 2.5 to 5.5kHz. This area is called the Crossover Frequency Range. In this area the phase difference of the emitted waves seems to have a quite constant value of 25-30 degrees (see the bottom part of the Figure on the right). This inter-driver phase delay is rather small allowing for an almost perfect wave addition in space. The result of this almost perfect wave addition is shown on the green (solid) curve on the right. It is interesting to check this addition at Crossover Frequency of the two Acoustic Branches (@3.6kHz). Both Responses are at 87dB SPL ie of equal intensity. If two equal intensity waves add perfectly the result will be twice that value. Doubling an SPL level means 6dB higher. 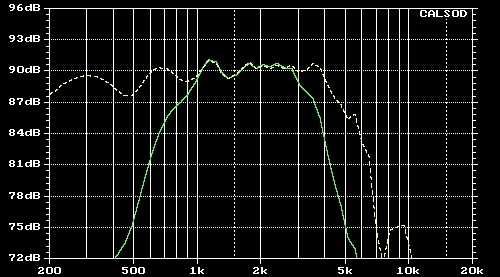 Indeed the green curve at this frequency has a 92dB value which is 5 dB higher than each Acoustic Branch. Obviously this is not a perfect addition but something quite close to it. The ideal would be for the two Branches to have a zero degree inter-driver Phase delay. -How bad can things go for wave addition in terms of inter-driver Phase difference? Well let us see what happens when we have almost 180 degrees of inter-driver Phase delay in the same set of example filters and drivers. We will only reverse the Tweeter's terminals causing an 180 degrees of change in the respective Phase Response. The overall SPL Response of the resulting wave exhibits a serious intensity dip at Crossover Frequency Range. It seems that the waves of the Acoustic Branches actually cancel each other at listening position. It is therefore evident that SPL & Phase Responses of both Crossover Filters and Drivers are of great importance for Speaker Systems Design.